Behold the pulverizing new album by one of the strongest names of the Russian underground Death Metal scene, turning each one of their compositions into instruments of torture, pain and gore. For nearly two decades, Russian Death Metal force Aborted Fetus has been unflinching in their pursuit of ruthless savagery, delivering unstoppable aural punishment and standing triumphant like a warlord on the broken bodies of their defeated enemies. 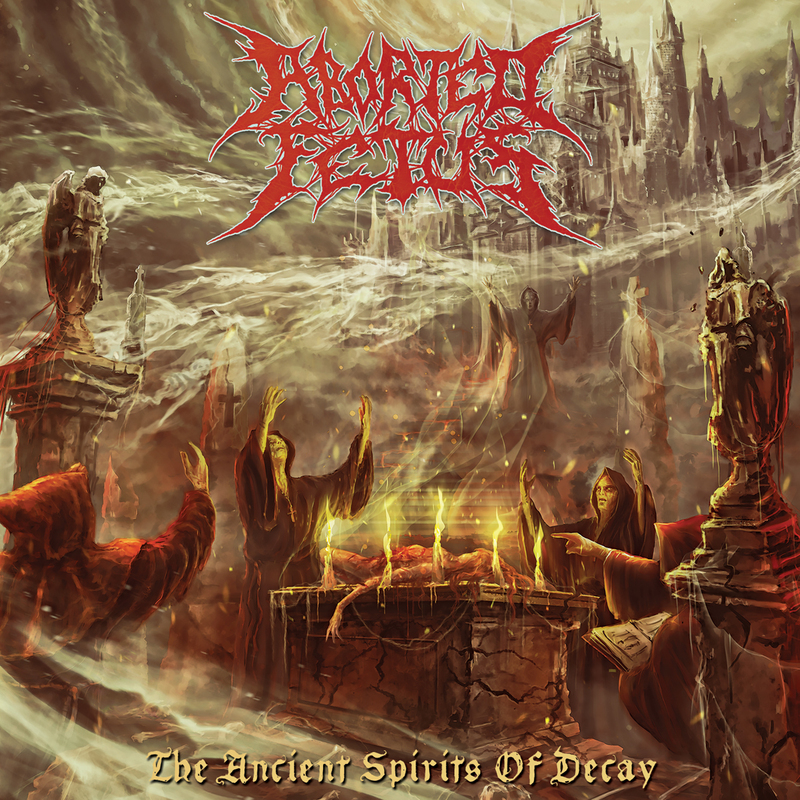 Now in 2018, this Perm-based squad founded in 2000 returns with another pulverizing opus titled The Ancient Spirits Of Decay, following the same ruthless path of devastation from their 2017 intimidating album The Art Of Violent Torture and being highly recommended for fans of Cannibal Corpse, Obituary and Devourment, among other crushing Death Metal giants. In The Ancient Spirits Of Decay, which features a demonic, creepy artwork by Russian artist Andrey Khrisanenkov (from Armaada Art), the horde comprised of Igor Stafeev on vocals, Alexander ‘Meatgrinder’ Andreev on the guitar, Sergey Shchapov on bass and Sergey ‘Hammer’ Kulakov on drums lives up to the legacy of old school Death Metal, turning each one of the songs in the album into instruments of torture, pain and gore. Needless to say, you better prepare your ears and minds for over 48 minutes of brutal devastation not recommended for the lighthearted, showing why Aborted Fetus are one of the strongest names in the Russian independent extreme music scene. Rising from the scorching pits of hell with the intro The Wind of Agonizing Spirits, here come Aborted Fetus and their crushing Death Metal in Eaten by Pigs in the Trough, the first “method of torture” from the album (that by the way reminds me of the 2001 movie Hannibal) and a gruesome welcome card by this filthy squad where Igor growls deeply like a devilish creature, while Hammer is bestial with his beats and fills; followed by Drenched Eyes in Boiling Oil, with the music sounding and feeling as destructive as the song’s name. Furthermore, Meatgrinder fires old school Death Metal riffs supported by the metallic bass by Sergey, keeping the atmosphere dense, menacing and gory. And they continue their path of sheer torture and pain with a classic Death Metal tune titled Nailed to the Cross, with Meatgrinder being unstoppable with his riffs and solos and Hammer pounding his drums like a stone crusher, and Beheaded on the Guillotine, where Igor keeps vociferating like a demon, also presenting some classic guitar solos to bring more balance to the utter devastation blasted by the quartet. Cradle of Revulsion kicks off with a soulful guitar solo supported by a pulverizing background, evolving into a piercing and menacing sonority led by Igor and his cavernous roars in what’s their most detailed and thrilling tune (with a few good breaks and variations to make the overall result even more potent), whereas total anarchy and chaos arise in a classic Death Metal chant titled Cold Lake of the Sinner, with Meatgrinder delivering pure shredding and Hammer once again bringing aggressiveness to the music, getting extremely gory just the way we like it. Then we have Flame of Death, an instrumental bridge spearheaded by Sergey and his low-tuned bass, setting the stage for Rack of Torment, another traditional, straightforward and demolishing creation by Aborted Fetus (despite falling flat after a while), with Hammer and Meatgrinder being in total sync helping Igor thrive with his deep growls, and the insanely heavy Roasted Alive in the Copper Bull’s Stomach, a short and cataclysmic extravaganza where Hammer sounds as demolishing as he can be, reminding me of the early days of Cannibal Corpse due to its rawness, which means it will certainly ignite some serious mosh pits during their live concerts. The last batch of torturing hymns by Aborted Fetus keep decimating our senses, starting with Genital Torture by the Alligator Tongs, which not only carries a “cute” name, but the music itself is also a blast of Brutal Death Metal with Igor’s growls getting deeper and deeper, while Meatgrinder continues with his feast of devilish riffs and solos. In Iron Petals of the Blasphemer’s Pear the band offers one final explosion of their devastating Death Metal for our avid ears, with Hammer leading their sonic havoc and Meatgrinder and Sergey slashing their strings mercilessly, ending in a melancholic instrumental outro titled Follow Into the Darkness, closing the album in a pleasant (but obviously obscure) manner. You can get more details about the brutal music crafted by these Russian metallers through their Facebook page, VKontakte profile and YouTube channel, and grab your copy of The Ancient Spirits Of Decay from their own BandCamp page, or from the Comatose Records’ BandCamp or webstore (as a special package including the album, a shirt and a sticker), as well as from iTunes, Amazon or Discogs. And after you possess such destructive album on your hands, it’s just a matter of hitting play and letting the torture begin. Best moments of the album: Eaten by Pigs in the Trough, Cradle of Revulsion and Roasted Alive in the Copper Bull’s Stomach. Worst moments of the album: Rack of Torment. 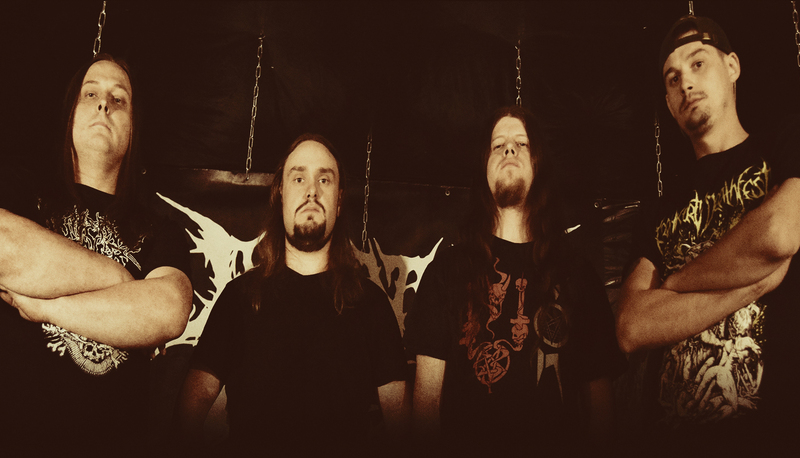 This entry was posted in 2018 New Releases and tagged aborted fetus, alexander 'meatgrinder' andreev, andrey khrisanenkov, armaada art, brutal death metal, comatose music, cradle of revulsion, death metal, eaten by pigs in the trough, igor stafeev, perm, roasted alive in the copper bull's stomach, russia, sergey 'hammer' kulakov, sergey shchapov, the ancient spirits of decay by Gustavo Scuderi. Bookmark the permalink.